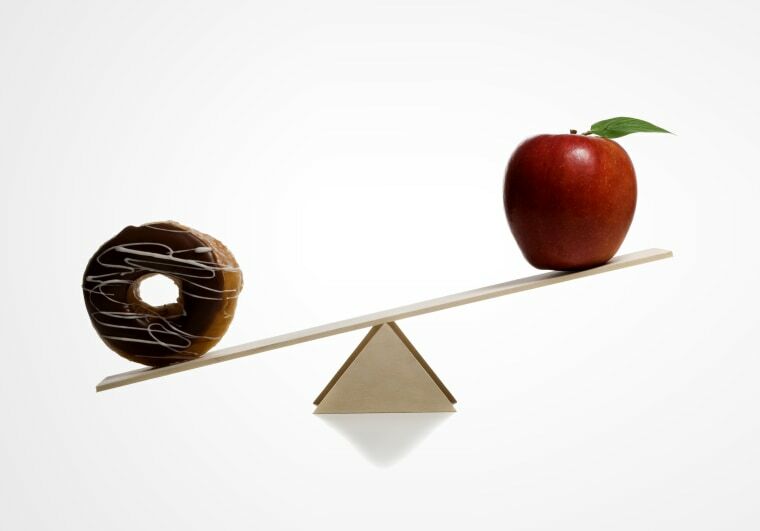 A doughnut, whole-wheat bread and an apple are all carbohydrates. The minute a beach vacation, a high school reunion or a friend’s wedding pops up on the calendar, we immediately wage war on carbohydrates. But is banishing carbs really the best plan of attack to slim down, tone up and feel your best? Not to mention, where do carbs come into play when it comes to our overall health? And why have they become the scapegoat for our muffin top? So before you ban every carbohydrate from the menu — know the facts. Carbohydrates are a actually a macronutrient (along with protein and fat) and they play a very vital role to your overall health, productivity and yes, your weight-loss success. The Dietary Guidelines for Americans recommend that 45 to 65 percent of the calories we eat come from carbs. Since it makes up such a large chunk of our diet, it's worth it to school yourself on the myths that are misinforming how you consume this important nutrient. Yes, that plate of steamed veggies you ate for lunch contained carbs. “Carbohydrates vary widely in terms of their nutrient density, so everything from a green bean, which is a good source of fiber, protein [and other vitamins and minerals] to a slice of white bread, which does not offer much other than carbohydrates, is considered a carbohydrate,” says Pegah Jalali, MS, RD, CDN, an NYC-based pediatric dietitian. Instead of saying, ‘I can't eat that,’ ask, what is a source of carbs that will provide me with more nutrition? That’s why carbohydrate-containing foods like starchy vegetables, legumes and whole grains are included in many healthy diet plans. Follow the 10:1 rule: Choose foods where for every 10 grams of carbs, there is 1 gram of fiber. The simple carbs, often found in processed foods and drinks, are easier for the body to break down, meaning they don’t keep you full as long and can lead to erratic blood sugar levels. That’s not to say that simple carbs are always bad for us. The trick is to look for foods that have a more robust nutritional profile. That apple may have simple carbs, but it also contains a hefty dose of fiber to slow down the digestion of the sugars. Research actually shows that while low-carb eaters tend to lose more weight at first, after one year, that weight loss levels out and is no different than those who eat a low-fat (moderate carb) diet. That being said, when it comes to carbohydrate-containing foods and weight gain, sugar and excess calories tend to be the culprit. “Really the secret behind carbohydrates is to identify and limit the amount of added sugar in your carbohydrate sources; highlight whole foods like fruits, vegetables, beans and whole grains; and pay attention to portion sizing carbohydrates along with your protein and fat sources,” says Amanda Markie, MS, RDN, LD, Outpatient Dietitian at UM Baltimore Washington Medical Center. “Sugar can be found naturally in foods like fruits and milk products, as well as being more concentrated into your processed foods like sodas, candy or baked goods,” explains Markie. Research shows that while low-carb eaters tend to lose more weight at first, after one year, that weight loss levels out and is no different than those who eat a moderate carb diet. So you want to ensure that you’re choosing sources of carbohydrates that have this naturally-occurring sugar. “Also look for higher dietary fiber with a lower amount of added sugar, which you can identify if it is one of the first ingredients on the ingredients list,” says Markie. “Limit those foods that have sugar within the first two to three ingredients." And just because you’re choosing the higher-fiber, low-sugar options doesn’t mean you can eat them in unlimited qualities: portions matter. A 2014 study published in the Nutrition Journal found that participants who ate a high-carbohydrate, high-fiber, vegan diet (they got 80 percent of their calories from carbs) actually saw a drop in average blood sugar, plus lost weight and had significant improvements in blood pressure. Plus, that glucose that our bodies gleans from digestible carb is needed for the functioning of multiple organs, including the brain. So that sugar in the blood stream isn’t just okay — it’s necessary. The problem is when they are released all at once in high doses. Fact: Not always ... you also need to use common sense. The Glycemic Index is a system that rank foods based on how much a certain portion increases blood sugar when compared to pure glucose. "One major setback [to the use of the Glycemic Index when choosing what carbohydrates are best] is that this index measures the body’s response when the carbohydrate is eaten without other foods, but how often are we eating a carbohydrate at a meal on its own?" says Markie. You may have a baked potato for dinner, but there's a good chance it's accompanied by a piece of salmon and some veggies. "Having these foods together can change the speed of digestion and your body’s response," says Markie. The Glycemic Index can be a guide in determining which foods are the better choices, she adds. Those lower on the scale may be higher in fiber, which slows digestion. But you need to use common sense to make the final judgement. "There are other cases in which the Glycemic Index does not direct the consumer toward the most healthful choice," says Markie. "For example, a soda has a Glycemic Index of 63, while raisins have a Glycemic Index of 64, however that does not mean raisins and soda have the same nutritional value." It's a tool you can use, but it should be one tool out of many, as it doesn't take into account the other nutritional values of the food, she adds. At the end of the day, all carbs are not created equal. So blindly counting net carbs isn’t the best way to establish a healthy diet. But food labels in their current state can be tricky to decode. However, Bowerman caveats that manufacturers can also add fiber to products afterwards, so you should check the ingredients list for a whole food source to ensure the fiber is naturally occurring. Luckily, deciphering the label is about to get a bit easier. The new food label to be implemented in July 2018 will specifically call out how much of the total sugar in a food is added, making it easier to distinguish between the unhealthy sugars you’ll find in many processed foods and the natural-occurring sugar in whole foods like fruit and milk. Until then, you can’t go wrong by choosing whole-food sources of carbohydrates that only have one ingredient — themselves!